Awarded to the midshipman of the graduating class who has done the most for Intercollegiate Sailing at the Naval Academy. Qualities of leadership, character, spirit, sportsmanship, sailing skills, and effort are determining factors. History: This trophy was presented to the Naval Academy by Mr. Carleton Mitchell, former Rear Commodore of the Cruising Club of America, and by Mr. Decoursey Fales, former Commodore of the New York Yacht Club. 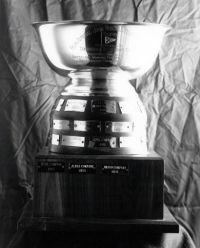 The trophy is awarded annually to the midshipman of the graduating class on the Intercollegiate team and is the team's highest honor. Won annually by the midshipman who contributed the most to varsity double handed sailing during the year through leadership, sailing skills, and dedication to the team. History: Mr. Albert C. Cavileer, a chartered member of the Naval Academy Sailing Squadron from 1947 to 1962, served as a sailing coach and advisor to the midshipmen on the yawls and ocean racers. 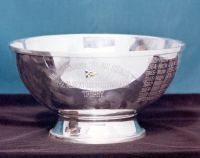 The midshipmen and members of NASS presented this bowl in honor of their friend for his devotion to the midshipman sailing program. Presented to the midshipman who has contributed the most to the intercollegiate team as a crew member through leadership, sailing skills, and dedication to the team. History: This trophy is dedicated in memory of Coast Guard Cadet Julia Babineau, who was an exchange student to the Naval Academy in 1980. Julia sailed for the Naval Academy and became a valued and special member of the dinghy team as a varsity crew. The following spring, she was tragically killed in a sailing accident at the Coast Guard Academy. This award honors the outstanding single handed sailor on the intercollegiate sailing team. History: The Class of 1916 Trophy was presented to the Naval Academy Sailing Squadron by the late Harris K. Lyle in 1976. It honors six fellow students from the Class of 1916 lost in enemy action. Those remembered with this trophy include RADM Henry M. Mullinix, RADM Charles P. Cecil, CAPT Casain Young, CAPT Frank Marston, CAPT Edward C. Fuller, USMC, and LTJG Stanton F. Kalk. Won annually by the midshipman of the intercollegiate team who contributed the most to Varsity sloop sailing through leadership, dedication to the team, and sailing skills. 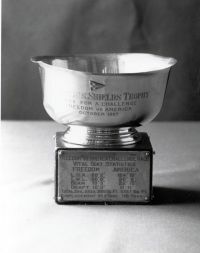 History: Established by NASS in honor of Mr. Cornelius Shields, Sr., this trophy recognizes his support of the Naval Academy Sailing program. Mr. Shields donated five Shields sloops to the Academy and served a number of years on the Fales Committee as an advisor. It also honors his long and exciting career as a yachtsman. He has the rare distinction of twice winning the Seawanhaka Cup, was the first winner of the Mallory Trophy and skippered Columbia during the final part of its successful 1958 campaign for the America's Cup. Awarded to the outstanding female sailor on the intercollegiate sailing team. In selecting the winner, the qualities of leadership, character, spirit, sportsmanship, sailing skills, and individual effort are the determining factors. 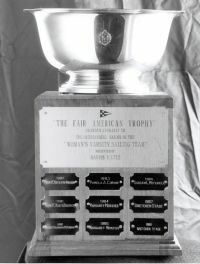 History: The Fair American Trophy was presented to the Naval Academy by the late Harris K. Lyle. Mr. Lyle was a friend and great supporter of the midshipman sailing program. 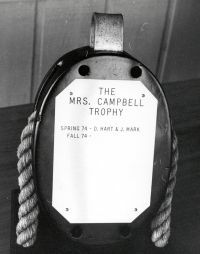 History: The Mrs. Campbell Regatta was initiated by the midshipmen of the intercollegiate sailing team to honor Mrs. Ann Campbell, a devoted and loyal friend of the Navy Sailing Team. She has also spent a lifetime in support of intercollegiate sailing. The trophy was designed and made by the members of the dinghy team and is presented annually by Mrs. Campbell. Won annually by the skipper and crew of the intercollegiate team who place first in the intrasquad regatta held during Commissioning Week. History: The Seelig-Ulmer Memorial Trophy was established in 1972 to promote the coeducational aspects of Intercollegiate Dinghy Racing. It is presented in the memory of MIlton C. Seelig, Charlotte K. Ulmer, and Charles Ulmer, Sr., by their sons, Martin Seelig, Class of 1962, and Charles Ulmer, Class of 1961. The participants are members of the intercollegiate team and/or their family members, friends, or drags. This award was originally presented to the plebe battalion which won the summer Knockabout Championship Race. 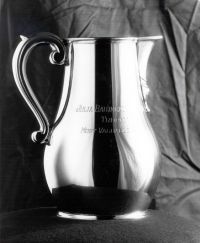 In 2000, the award was given to the Fall Intramural Sailing Battalion Champions. History: Admiral Blakely, class of 1892, was awarded the Navy cross, rose to rank of Rear Admiral in 1926, and was commanding officer of the USS Arizona during World War I. Commodore Decoursey Fales, former Commodore of the New York Yacht Club, presented this trophy in honor of Rear Admiral Blakely, under whom he served on the Arizona. This trophy is presented to the midshipman helmsman who has the best combined score in the J/24 intersquad regattas held annually during the fall season. The winner counts scores from both a fleet and match racing intrasquad event. 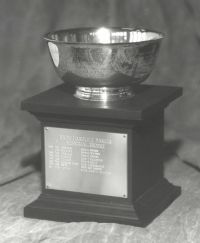 From 1962-2000, the Hill Trophy was awarded to the midshipman of the graduating class who had written the best paper on sailing at the Naval Academy. 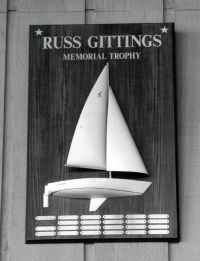 In 2001, the award was rededicated to the best trimmer on the Varsity Offshore Sailing Team. History: This trophy was presented to the US Naval Academy by Mr. Decoursey Fales, former Commodore of the New York Yacht Club, in honor of Admiral Harry W. Hill, USN (RET), former superintendent of the Naval Academy. The trophy is awarded annually during May Week to the graduating midshipman who has shown outstanding achievement in the area of sail trim through leadership, skill, and dedication to the team. Recognizes captains of both the Varsity Offshore and Intercollegiate Sailing Teams. 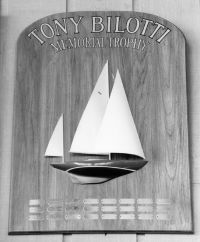 History: This award, established in 1981 by the Naval Academy Parents Club of Northern California, is in memory of LTJG Tony Bilotti, Class of 1977, who lost his life in a tragic accident at sea. Tony was an active and enthusiastic member of the Yawl Team while attending the Naval Academy. Championship. Ms. Madeline was the graduate secretary of MAAWS and helped initiate the first women's nationals. Won by the skipper of the Naval Academy vessel with the best corrected time in either the Annapolis to Newport race, in odd years, or the Newport to Bermuda race, in even years. 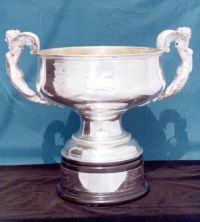 This trophy is awarded biannually to the Naval Academy Yacht with the second best corrected time in the Newport Bermuda Race. 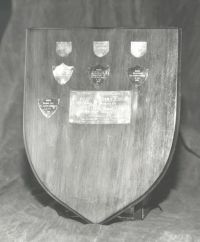 History: The Scarritt Adams Shield was presented to the USNA in June of 1980 by Mrs. Scarritt Adams of Paget, Bermuda. This shield is given in memory of her late husband Captain Scarritt, USN, class of '30, who was the first midshipman from Bermuda to graduate from the USNA. The wood of this plaque is Bermuda cedar and came from a tree which was on the Adams's property in Paget. Capt. Adams was always keenly interested in sailing and was a member of the New York Yacht Club as well as the Royal Bermuda Yacht Club. Presented to the navigator of the Naval Academy yacht which finishes first on corrected time in the biannual Newport-Bermuda race. History: The Naval Base of Bermuda presents the Dan A. Kimball Trophy biannually. 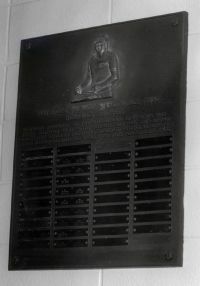 Prior to 1966, the trophy remained on display in the Administration Building of the Base. 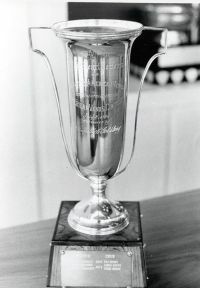 After the 1966 race, the trophy was donated for permanent display at the Naval Academy. 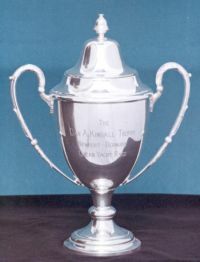 Each year, NASS provides a suitable keeper trophy for presentation at the awards ceremony in Bermuda. 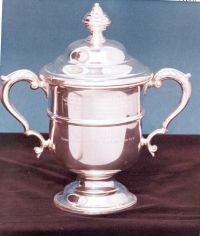 Awarded biannually to the midshipman navigator of the Naval Academy yacht with the best corrected time within its division in the Annapolis-Newport race. History: The Carey Arthur Memorial Trophy is presented in the memory of LTJG Carey Arthur, Class of 1979. The name of the biannual winners are engraved on the trophy, which is on display in the Hall of Fame. Awarded annually to the midshipman skipper of a Naval Academy Navy 44 Yacht with the best corrected time in the NASS Spring Regatta. History: In 1957, Mr. Walter N. Rothchild donated his yacht Avanti to the midshipmen of the Naval Academy. However, before the yacht could be delivered, Hurricane Carole lashed the New England Coast and destroyed her. 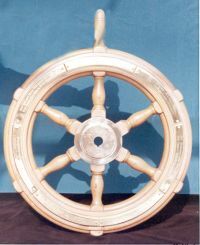 Mr. Rothchild recovered Avanti's wheel and forwarded it to the Naval Academy. It is now a perpetual trophy on display in the Hall of Fame. History: On August 5, 1911, the New York Yacht Club Cruise Trophy was won by the Yacht Intrepid, owned and skippered by Lieutenant Lloyd Phoenix, USNA, Class of 1861. The trophy was subsequently gifted to the Naval Academy to be awarded to the deserving midshipman. History: This perpetual trophy was presented to the Naval Academy by Mr. E. Bates McKee of Annapolis. It honors Rear Admiral Harold E. Parker, who was a great Naval Officer and ardent sailor. Presented to the midshipman skipper in the PHRF fleet with the best overall finish position in the Annapolis Yacht Club Fall Race Week. History: The yacht Highland Light was donated to the Naval Academy by Mr. Dudley Wolfe and served the Academy well for 26 years. Mr. Wolfe also established a fund which plays a major role in supporting the Naval Academy Sailing Program. 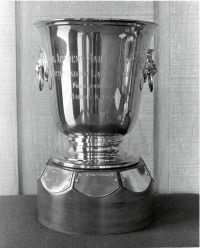 The Highland Light trophy was conceived by the Naval Academy Sailing Squadron as a memorial to Dudley Wolfe. 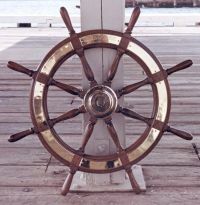 The trophy was made from the wheel of the yacht and remains on display in the Hall of Fame. 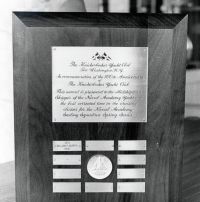 Awarded to the midshipmen skipper of the Naval Academy varsity sailboat with the best combined finishing position among competing sailboats in the NASS race to Oxford and the Tred Avon Yacht Club's Hammond Memorial Race. History: This award was established by the members of the Naval Academy Sailing Squadron to honor LCDR Frank Siatkowski, USN (RET). It hangs on the wall on the first deck of the Robert Crown Sailing Center. Presented to the midshipman who has contributed the most to the Varsity Offshore Sailing Team during the year through leadership, dedication to the team, and sailing skills. 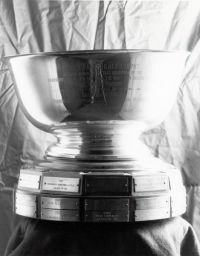 History: The Dubose Trophy was presented in 1958 to the Naval Academy by the Intercollegiate Yacht Racing Association, the predecessor to the Intercollegiate Sailing Association. It honors the outstanding midshipman on the Varsity Offshore team. 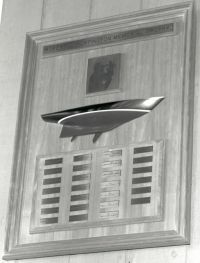 Beginning in 2001, this award was given to the outstanding foredeck crew on the Varsity Offshore Sailing Team. Prior to then, it was won annually by the midshipman skipper of the Naval Academy yacht with the best corrected time in the NASS spring series. 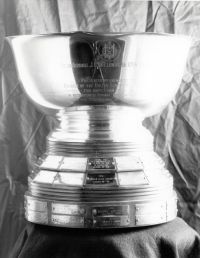 History: This trophy was established in 1974 and was presented to the Naval Academy by the Knickerbocker Yacht Club in Port Washington, New York. It is in recognition and commemoration of the club's 100th Anniversary. 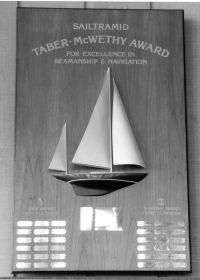 History: The Taber-McWethy Award was established in recognition of exceptional service contributed by LTGEN Robert C. Taber, USA, RET and Captain Robert D. McWethy, USN, RET, in the development of the midshipmen offshore cruise credit sail training program at the Naval Academy. It honors the hallmarks of unparalleled professional competency, expertise under sail, personal dedication and bench marks excellence in seamanship and navigation. The Holloway Trophy honors the midshipman who has contributed the most to Varsity Offshore J/24 sailing through his leadership, dedication to the team, and sailing skills. 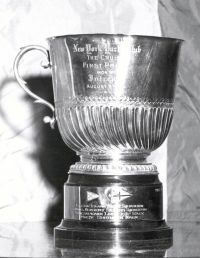 History: This trophy was presented to the Naval Academy by Mr. Decoursey Fales, past Commodore of the New York Yacht Club. It was given in honor of RADM James L. Holloway, Jr., USN (RET), a former Superintendent of the Naval Academy. Presented to the most well rounded and capable senior midshipmen within the OSTS program. Navigation, seamanship, and leadership are among the criteria evaluated. History: Established in 1989, this award is named in honor of RADM Robert W. McNitt, whose accomplishments as a distinguished naval officer and in the sailing community best embody those traits desired in our future leaders. Presented to the midshipman navigator whose professional skills and performance have contributed most to the Varsity Offshore Sailing Team. 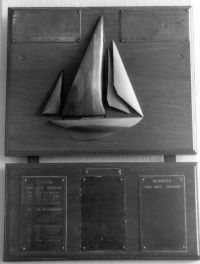 History: This memorial trophy was presented to the Naval Academy by friends of the late LT Robert D. Huntington, Jr., USN, an ardent supporter of the Naval Academy Sailing Program. His leadership and talent as navigator and afterguard on Naval Academy yachts during 17 ocean races earned him the respect and admiration of the midshipmen who sailed with him. 1989 Larry M. Cook Jr. Awarded to the midshipman of the graduating class for excellence in academics and performance in Naval Academy sail or power craft. History: This trophy was presented in 1995 by the members of the New York Yacht Club to mark the 150th year anniversary of the US Naval Academy. Performance in seamanship, navigation, leadership skills, and academics will be assessed in determining the winner. Awarded to the midshipman from OSTS and VOST who does the best job maintaining his/her vessel. History: Bing Simpson, Class of 1948, was a lifelong sailor who served on the Fales Committee for ten years and was President of the Naval Academy Sailing Foundation for eight years. This award was donated by family and friends in his memory. The award shall be a tool kit which is presented to the midshipman who does the best job maintaining his/her vessel. One winner will be from the Varsity Offshore Sailing Team and the other from the Offshore Sail Training Squadron. 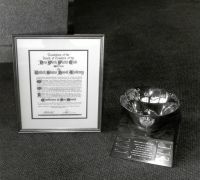 This award is presented to reward the attempts of novice members on Intercollegiate and Varsity Offshore sailing teams. The winner will be the 4/C novice sailor who displays the most improvement over the course of the season. This will take into account not only sailing skills displayed, but sportsmanship, dedication to the team, and enthusiasm for the sport. The names of the winners will be engraved on the trophy, which will remain on display in the Hall of Fame at the Robert Crown Sailing Center. The novel, My Old Man and the Sea, will be presented as a keeper award to the winners each year. History: This award was established in 1997 to honor LCDR Robert S. Williams. He was a pioneer Navy jet pilot in World War II and later was stationed in Corpus Christi, Texas as a flight instructor. After he retired from the Navy, he moved to Annapolis, where he became a member of NASS and an active supporter of the midshipmen sailing program. Locally, he successfully raced his Cal 25 and Call 227 on the Chesapeake Bay. The Cotter Family Seamanship and Navigation Award is given annually to the Midshipman who has demonstrated outstanding seafaring and navigation skill as a member of the Offshore Sailing Team. History: The award is named for the Cotter family: Edward Cotter, Sr. (Captain, USCG, Ret); Jeffrey Cotter (LCDR, USCG, Ret) and Edward Cotter, Jr. (CDR, USN, Ret). 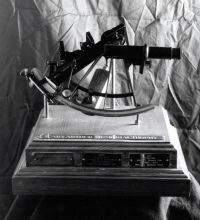 Captain Cotter used the sextant mounted on this award in numerous offshore races in the 1960's and 1970's and was one of the most sought after navigators, long before GPS. He navigated the 1970 Bermuda Race winner Carina and set a course record in the 1972 Annapolis to Newport Race aboard Equation. Captain Cotter participated in numerous SORC contests and was a member of the 1973 United States Admiral's Cup team. He authored four books on sailing and many published articles on seamanship and navigation.